Preston is a residential suburb 9 km north-east of central Melbourne. It was also a local government area from 1871 until 1994. The area was surveyed by Robert Hoddle and subdivided into farm allotments in 1837. The origins of Preston's settlement were generally along the Plenty Road, from Melbourne to the Plenty Ranges. In 1850 Edward Wood opened a store at the corner of High and Wood Streets, High Street branching off Plenty Road and being a route to Sydney. Wood, who came from Sussex, England, is thought to have given the name Preston, after Preston in Sussex. He was a founding member of the Baptist Church (1859). Hotels were established near Woods store and near the junction of High Street and Plenty Road, 2 km to the south. Between these two localities is modern day Preston central, known as Gowerville in the 1880s. In 1854 Anglican and Wesleyan primary schools were opened, and in 1866 the first State school was opened just east of the High Street and Plenty Road junction. Another school, Tyler Street, was opened in 1875 in the vicinity of Woods store, shortly after the denominational schools closed. Not all of Preston's land was good for farming, dairying and market gardens. Building material was cut from the basalt and the non-basaltic areas yielded clay for potteries and bricks. A bacon curing factory began in 1862 and a tannery in 1865. Several larger factories followed, notably Huttons Hams and Bacons and Zwar's Parkside Tannery. Preston's first involvement in local government was as part of the Epping Roads District in 1854, which included Northcote. In 1870 the Epping District was amalgamated with Merriang, Whittlesea, Morang and Woodstock Roads Districts to form a very large Darebin shire. The following year Preston and Northcote were separated from Darebin to form the Jika Jika shire. On 11 September 1885, Preston and Northcote were proclaimed as separate shires. Preston's urban growth spurt came in the 1920s. The railway journey to Melbourne had been improved by a direct connection between Collingwood and Melbourne (instead of a westerly loop to Spencer Street) in 1904, and tram services from Miller Street and Tyler Street via St Georges Road to North Fitzroy were opened in 1920. The Preston tram sheds were opened in 1925. The trains were electrified the following year. Electricity reticulation was begun in 1914 and sewering of the Preston district was undertaken in 1909-15. The West Preston primary school (actually close to Preston central) was opened in 1915 and by 1928 had over 1000 pupils. The Preston East primary school about 2 km from West Preston, was opened in 1928 and the Girls' high school, later Preston Girls Secondary College, was founded in 1928. (The later closed in 2013 following dwindling enrolment numbers and competition from nearby Northcote and Thornbury secondary colleges.) By 1930 shopping strips had formed along High Street and Plenty Road, and most of the suburban streets to the east and west were completely settled. On 14 March 1922, Preston was proclaimed a borough, two months later a town and on 14 July 1926, a city. Its area was 37 sq km extending from Mahoneys Road (north) to Miller and Dundas Streets (south). The Merri and Darebin Creeks partly defined its western and eastern borders. The 1930s Depression affected new home dwellers and the new council at an economically vulnerable time, when financial reserves were scant or non-existent. A bright patch was Roy (‘Up There’) Cazaly's coaching of the Preston Football Club in 1931. During the world wars two local men who enlisted gave their names to future localities and both were Victoria Cross winners: William Ruthven (World War I) and Private Bruce Kingsbury (posthumously awarded New Guinea). 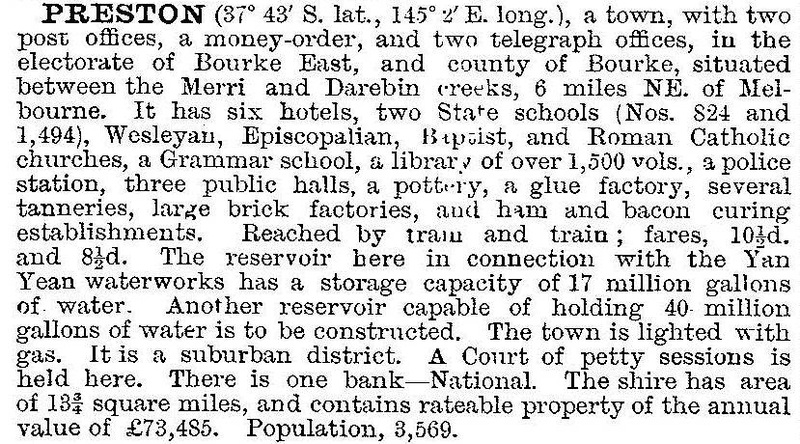 Kingsbury adjoins Bundoora and Ruthven is the name of a railway station and a P-12 college in Reservoir. Preston, in conjunction with Brunswick and Northcote, have elected some notable politicians to State and Commonwealth Parliaments. Frank Austey (1865-1940) served in both parliaments and John Cain (senior) was Victorian Premier three times between 1943 and 1955. Left wing political agitation influenced the provision of municipal relief work during the economic depression. Although some jobless residents left the area, the improvements to parks and pavements helped to attract new residents. The population grew by 40% between the 1933 and 1947 censuses. In the earlier part of this growth the Technical School was opened (1937), later to become a Technical College (1964) and later the Preston Institute of Technology. Between 1947 and 1954 Preston municipality's population grew by 37%, reaching nearly 64,000. The West Preston primary school's enrolments topped 1000 until other schools were built. Between 1947 and 1966 the Housing Commission built about 2600 dwellings in east Preston and Reservoir. In 1966 11% of Preston municipality's population was in Commission dwellings. During the 1960s the Council actively promoted street construction schemes to overcome a backlog of suburban quagmires. In 1958 the Preston and Northcote Councils achieved a 15 year vision when the Preston and Northcote Community Hospital (PANCH) was opened in Bell Street. The Housing Commission disposed of some of its land in East Preston in 1963 to the Myer Emporium, and on 4 October 1966, the Northland drive in shopping centre was opened. 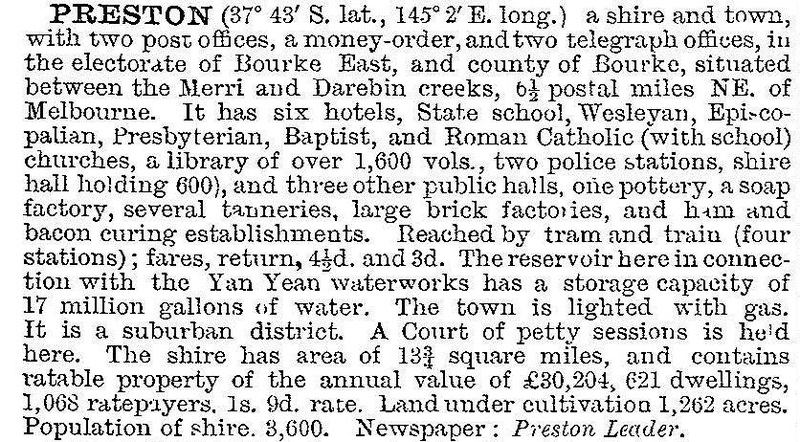 Further east there was more empty land where a wedge of the Preston municipality occupied Bundoora. In 1964 the site for Victoria's (third) La Trobe University was announced and it opened in March 1967. It adjoined hospital facilities at Mont Park. The Plenty Road tram service was extended in stages from Tyler Street to the University in the 1980s. The continuing population growth through the 1960s stimulated the building of secondary schools. Preston East Technical and High schools were opened near Northland in 1960 and 1964 respectively, the former later becoming Northland Secondary College. (In 1993-95 the College was the subject of a dispute on the grounds that its closure discriminated against Koori children). The technical school became an Islamic college. The suburb of Preston is located in the south of its former municipal area extending from Miller/Dundas Streets to Regent/Tyler Streets. Other place names in the Preston suburb are Bell (railway station and primary school) and Regent (railway station). The north of the former municipal area included Keon Park, Kingsbury, Reservoir and Ruthven. High Street, Preston, and the Preston market are strong retailing areas, being about 2 km from Northland and having a considerable catchment in West Preston. In 2014 a development of Preston market proposed a 28-storey apartment tower. Preston's parks and recreation spaces are not numerous. There were two drive-in theatres in East Preston in the 1980s, but by 1995 the only drive-in theatre in inner metropolitan Melbourne was in neighbouring Coburg. The Northland twin drive-in became the Northland bulky goods shopping centre. 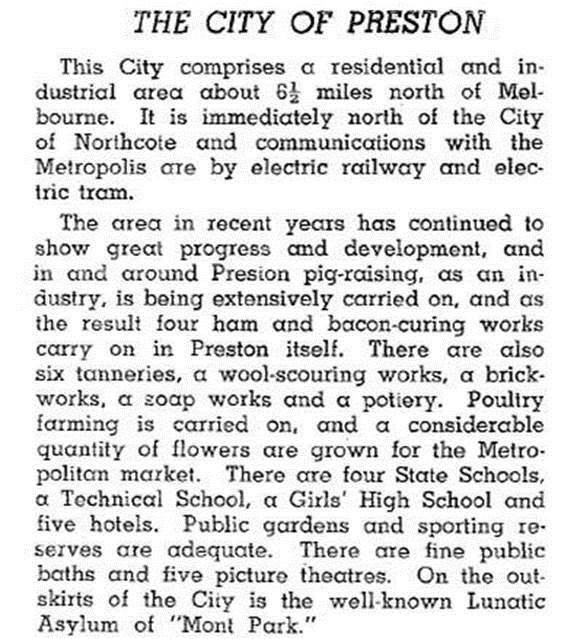 In 1981 the Melbourne and Metropolitan Board of Works confirmed its designation in 1954 of Preston as a District Centre. On 22 June 1994, Preston city was united with most of Northcote city and a small part of Coburg city to form Darebin city.